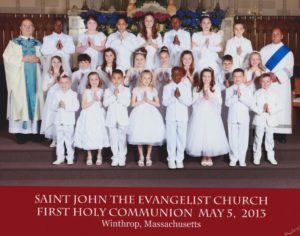 St John’s offers religious education for grades 1-10 as well as the sacraments of First Reconciliation, First Communion, and Confirmation. Have you ever thought of what you could do for your church? The Religious Education Office needs your help! 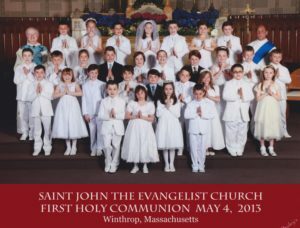 Help pass along your knowledge of our Catholic Religion to the students of St. John’s. It is only once a week for the weekly program and twice a month for the Sunday School Program. The Sunday program begins September 14 and ends in April. 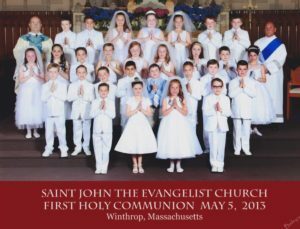 Sunday School Program starts with the 10am Family Liturgy and classes are immediately following the Mass. Classes usually don’t exceed 12 students and the best part is…we give you the book with all the answers in it. How could you say “No” to that? If you are thinking “Maybe…?? ?” then come on over for a visit to the Religious Ed. Office in the school building and take a look at what we have to offer. Please contact us to learn for which grades and days we still need instructors. We are in the office Monday through Thursday from 8am until 3:00pm. Or you can reach us at (617)846-3100 with any questions you may have. Visit this registration form if you only want to volunteer and you do not have children registering for the program. IF CLASSES ARE GOING TO BE CANCELED BECAUSE OF WEATHER, THIS INFORMATION WILL BE ON OUR SOCIAL MEDIA PAGES AND ON WCVB CHANNEL 5 .